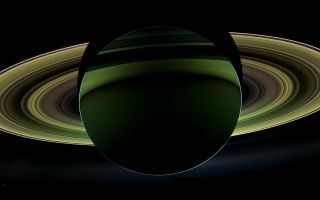 This stunning space wallpaper shows NASA Cassini spacecraft's glorious view of Saturn, taken while the spacecraft was in Saturn's shadow. The cameras were turned toward Saturn and the sun so that the planet and rings are backlit. (The sun is behind the planet, which is shielding the cameras from direct sunlight.) In addition to the visual splendor, this special, very-high-phase viewing geometry lets scientists study ring and atmosphere phenomena not easily seen at a lower phase.